We all love loot, but we don’t love all loot, right? The pickit is the instructions for the bot on what to pick up, keep, salvage or sell. Even though this is a lengthy guide, pickits are really simple and it will serve you well to know how to setup and change/tighten one over time as your character evolves and certain items or stats becomes less interesting. If you have a specific question or just want to learn how to make or tweak a pickit, the answer is probably in this guide somewhere. The order of the filters in the pickit is very important. The first filter (starting from the top) that applies to an item wins. Remember that. Place “Keep” filters above “Salvage” filters. There’s only one exception to this rule and that is the “Do not pick” checkbox. Any other filter that dictates an item to be picked up, will trump a “Do not pick” rule, despite order. If an item is picked up, but there’s no Keep or Salvage rule for it, it will be sold. This is to be able to buy it back from the vendor in case you notice your mistake. Example: You create a “Keep Ancients” rule, which means bot will have to pickup all Legendaries, non-ancients included. Without also adding a “Salvage Legendaries” filter non-ancient legendaries are not specifically handled in the pickit (i.e. omitted) which means the bot will default to selling these. 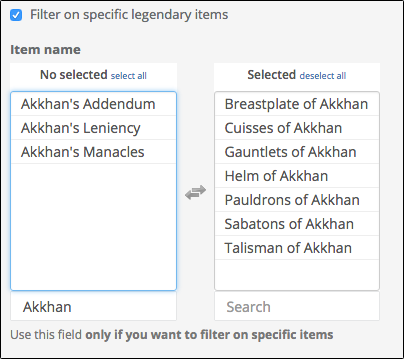 Example 2: You previously had a filter that said “Keep Ancients” but you’ve now edited this filter to only keep an ancient if it matches the name of - let’s say 10 - specific items. 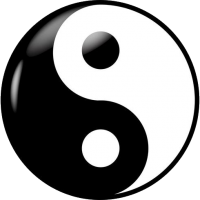 Suddenly all other Ancients are omitted and will be sold. 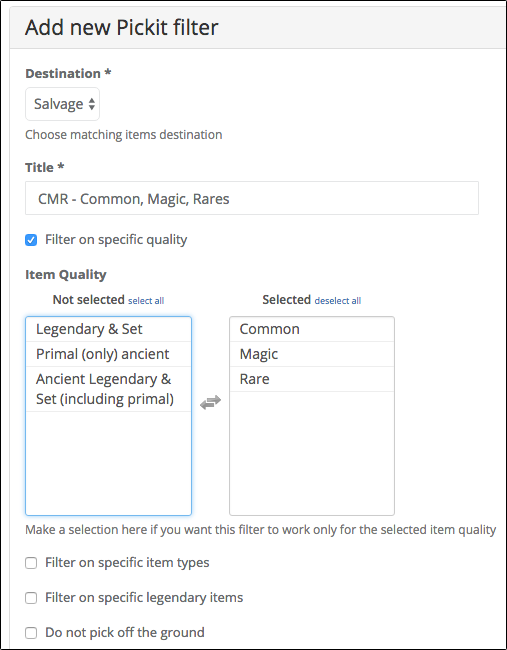 You’ll need to add a “Salvage Ancient Legendaries” filter to your pickit, or edit and add Ancient Legendary to an existing Salvage filter. So, if you notice bot sells things there’s simply a missing rule for that type/name/quality, and if you notice it salvaging things you wanted to keep, you probably didn’t place the “Salvage” rule below the “Keep” rule. Or, you overdid it using both Item Name and Item Type in the same filter which possibly created a non-existing combination. Step by step guide creating a very simple but effective Ancients+Primals only pickit. Make your way to your Pickit page under “My account” on the website. Click the blue “Add new pickit” button. Name it whatever you want. In this example, we’ll make a Keep all Ancients simple pickit. Let’s start with the important stuff first, i.e. what to “Keep”. This is all you need to do for this first filter. 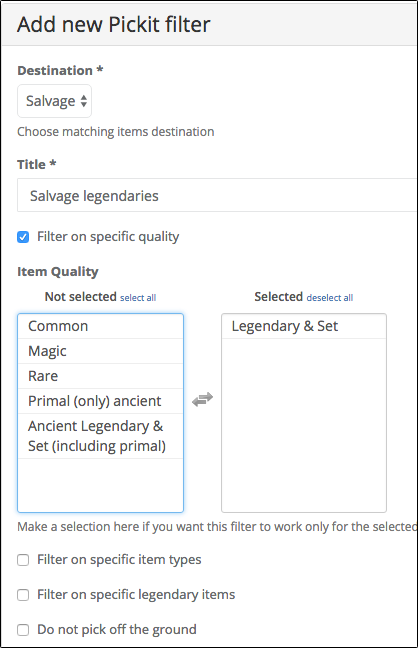 Name it, tick the “Filter on specific quality” checkbox and select “Ancient Legendary & Set (including primal) and scroll down and click the green “Create pickit filter” button. This pickit will now Stash / Keep all Ancient and Primal legendaries and set items. Next we wanna add something all pickits should have in them, a filter for Crafting Materials and things like that. Click the Green “Add new pickit filter” button. Moving on. Now we make a choice of whether we are going to pickup and salvage grey/white, blue and yellow items, or not pick them up at all. For this example let’s go with picking them up and salvaging them. Create yet another Pickit filter and name and configure it as shown to the image below. 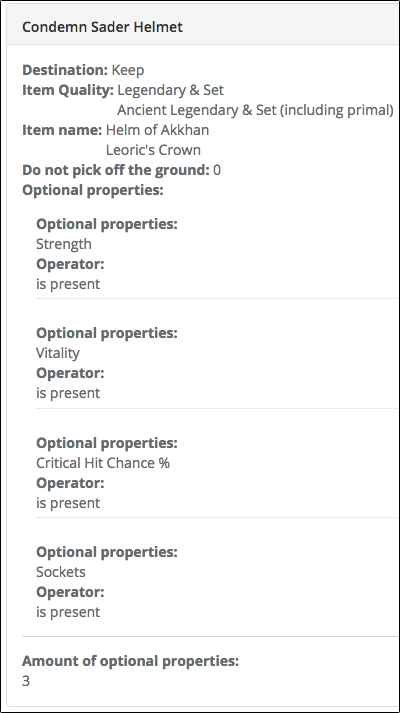 If you don’t want to pick them up, just tick the last checkbox “Do not pick off the ground”. A rule is still needed, since blues and yellows also makes their way into your inventory from spending blood shards at Kadala, as well as the occasional misclick/accidental pickup. That’s the stuff we want to keep. Now we got to have a filter to take care of the stuff we don’t want to keep, or bot will just sell it instead of salvaging. Remember, our first rule was about Keeping Ancients and Primals, so we’ve yet to make a rule for normal legendaries. Add yet another filter to the pickit by clicking the green “Add new pickit filter” button, and configure it to salvage Legendaries. There’s also some general Pickit settings to do at the bottom. No need to change Item Scan range for now, keep it at 75. Gold is handled by our equipped pet, so put 1000000 (1 million) in the gold box to tell bot to only actively go pickup gold if one single pile is that large (which will never happen). Tick the gems you want the bot to pickup, as well as if you want the bot to care about Health Globes and how far it’s allowed to stray to get them. A few yards above your characters pickup range should suffice and not waste too much time going after the globes. If it’s a new season you may want the bot to automatically go “Learn” all the blacksmith and jewelry plans it picks up. The last 2 checkboxes for rift keys and identifying is something you don’t have to care about at this point. Click the blue Save button at the bottom, and that’s it. Your first simple “Keep ancients and primals” pickit is done! If you are using a Local Profile in bot, click the “Reload data from Website” button to have this new pickit show up in your Pickit selection drop-down menu in the bot GUI, select it and you’re set! If you are using a Master Profile, this pickit will be available to select when you create/edit the master profile. CMR is short for Common, Magic and Rare, i.e. grey/white, blue and yellow items. L is short for Legendary and A is short for Ancient. This type of pickit require Change of Cache settings*, since we’re not picking up legendaries. The cache is the bots memory. What to run back to if fighting pulled it away from it before bot had time to take care of it. If we are not going to pick up legendaries by using one of the last 2 pickits in the list, we need to make sure bot doesn’t run back to them only to discover the pickit says to not pick them. It will create a ping-pong action of running back and forth over and over. For local profile, this cannot be done in the bot application GUI. You need to edit the C:\Users\your_username\Documents\RoS-Bot\RosBotCacheSettings.ini file (using notepad to open it works). Change “DoNotCacheLegendaryItems = False” to “True” instead. For master profile, edit the Cache profile as you would edit any other parts of the master profile. Tick the “Do not cache legendary items” checkbox to skip Caching them. At a later point you will probably get annoyed by the bot stashing every single Ancient, and want to make your pickit more strict. We’ll use your earlier created pickit as a starting point. 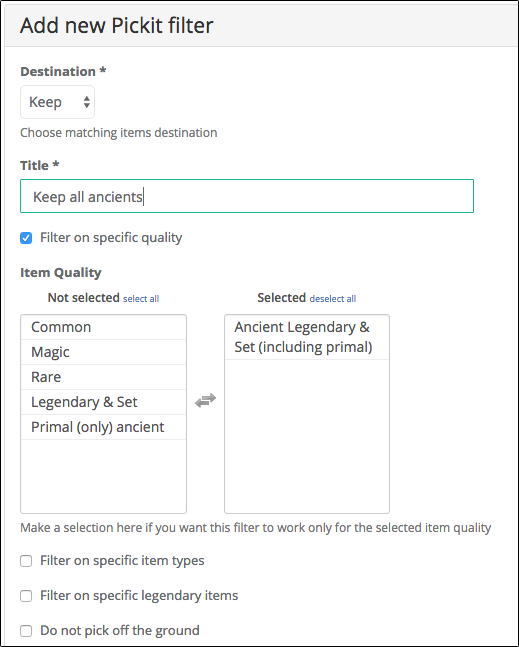 Your first filter in the pickit you created earlier was configured to keep all Ancients and Primals. Edit your pickit, and click Edit on that first filter. Tick the “Filter on specific legendary items” checkbox and start adding the items of the only Ancient and Primal items you want to keep. 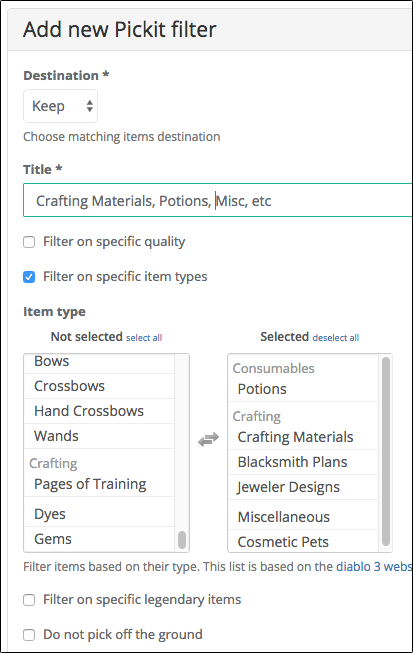 Use the search next to the list of items to find them faster, as well as filter on a set by name. I’ll use “Akkhan” and then add the items from that set. After that, keep adding all relevant items. Check script’s linked d3planner to see which items it is you need and want. You may also rename the filter from “Keep all ancients” to “Keep these ancients” just so it accurately reflects its actual function. When all are done, save the filter. Do note with this change, there’s now a lot of unwanted items with Ancient (incl primal) quality that we aren’t handling in the pickit. We've changed the only rule in the pickit regarding Ancients to now only cover the specific Items in the image above, leaving the rest of the Ancients omitted/unhandled. So, you’ll have to go edit that last Salvage filter in the pickit, and include "Item Quality: Ancient legendaries & Set Items (incl. primal)" to it, so that these now unwanted Ancients are in included in the Salvage filter, or they will be sold instead which is a loss of Forgotten Souls, a valuable crafting material. Save it, and that’s it! You’ve now made your pickit only keep the ancient or primal items you want, and salvage the rest whichever quality they have. It looks a bit complicated, but it really isn’t. I’ll try to explain it as best I can. so that’s why I specified that we only want to keep this Ancient or Primal Helm of Akkhan or Leoric’s Crown if it has at least 3 of them. Not that hard. It will now Salvage other Ancient or Primal Helmets of Akkhan or Leoric’s Crowns that can’t be rerolled to what we want. for bot to keep it if we already have a good one and don’t care for low value ones. And even more, we can add secondary stats requirements too, like Fire or Physical resistance and raise the minimum number of optionals required to 4. This is super strict and would basically only Keep ancients and primals with near perfect rolls. Image below shows how that would look like. It may take months before an item like that drops, so it’s really only for end-game upgrades when you already have awesome gear. This is really just for the end-game upgrades, but when you are ready to make your pickit this strict, you know you can reopen this guide for guidance on how to achieve it. Why have different pickits for different content? Botters care about efficiency. Picking up items take time away from XP farming, or finishing those pesky bounties. Just as a master profile allows you to have different Fast Modes and Avoidances for easy T13 rifts/bounties and really hard 110 GRs, you may want to skip certain items/item types when running T13 rifts for keyfarming or running bounties for the cache-rewards. As an example, I skip gems, greys/whites, blues, yellows, in T13 content like rifts and bounties, but in GRs it may be good to just pickup everything after guardian is killed at the end, since that’s all in one pile anyhow and only takes a second. When you are happy with your pickit, replicate/clone it to get a copy of it. Edit that one to not pickup gems and CMR for example, call it speed-pickit and use that for sequences like normal rifts and bounties. It will require you to update more than 1 pickit when tightening/making it more strict, but in the end it’s worth it. With a master profile you don't have to switch between pickits when you change what content bot is doing. You can pre-define which pickit to use for Rifts, which one for Greater Rifts and which one for Bounties, etc. Commonly asked questions about what needs to be in pickit for these things to be picked up and saved. Any pickit that picks up Legendaries and salvages non-ancient or non-primal ones will get the transmog. If you want to keep the actual item as well, you need to Keep Legendaries and Ancient legendaries (incl. primal) or a specific filter with Item Name. What’s been described so far in this guide is what’s the common way of doing pickits. But the normal way of doing pickits has one flaw, it picks up all legendaries, even if it’s an item type we might not want at all. This is because bot doesn’t know much about the item until it has picked it up. Specifics on this in the next chapter, "What bot knows, and when it knows it". The alternative way of doing pickits, is not by Item Name, but rather by Item Type. Type is one thing that bot do know before picking the item up, which means we can use this to skip picking up Helmets if we already have one that’s perfect. Skip picking up some legendary items altogether, based on Item Type, while still picking up others, i.e. spend less time picking up things and more time killing stuff. Cache setting "Do not cache legendaries"
Requires the Cache settings described earlier, to not run back to every Legendary on the ground and get stuck in a ping-pong loop of running back and forth. Can disable pickup of a whole Item Types, like Helmets, Swords, Rings, etc. Slightly faster rifts/grifts due to less items picked up. Cannot detect item names so Keeps items when they have the right rolls, even though it's not the specific item (name) you wanted. Require you to clean out your stash manually more often. There's a few Item Types bot doesn't recognize on the ground, Belts being one of them. You can create separate filters for each item Type and use Optional Properties if you want to, and an example with Helmets is included in that pickit. If you, make sure to remove that item Type from the first filter. 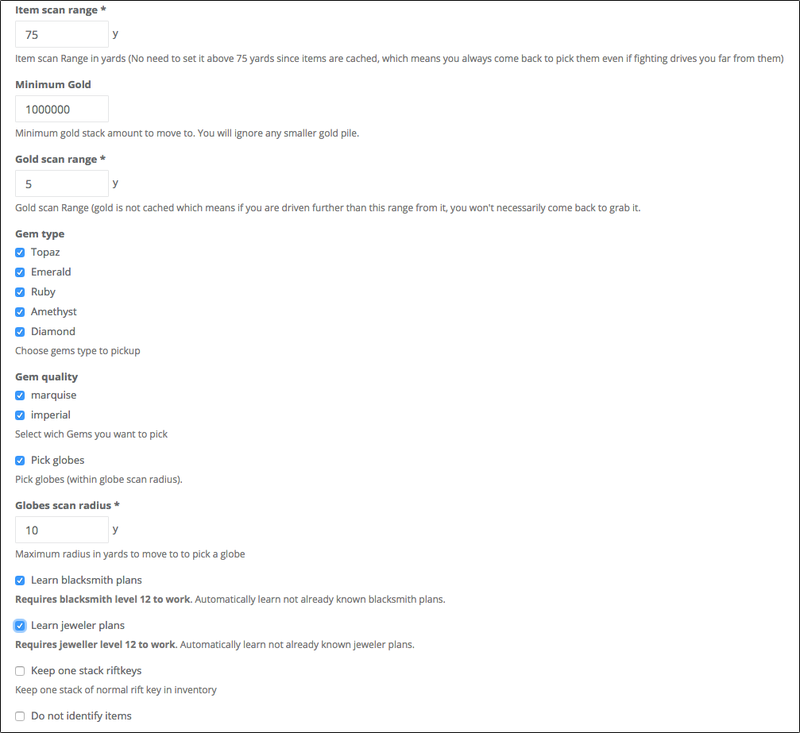 The bot learns about the item in different stages, you could say. The so far known pickup bugs and quirks. If Item Type: Common is set to Keep, Bounty Caches are stashed despite other settings.